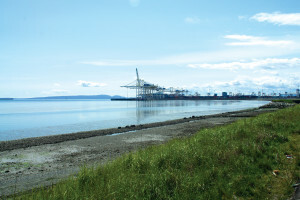 The Port of Vancouver is located within an ecologically rich region that is home to culturally iconic species such as the southern resident killer whale and white sturgeon. Industrial activities within the port have the potential to affect the surrounding natural environment and human health through habitat loss, pollution, physical degradation, and introduction of invasive species. We are committed to supporting healthy ecosystems and to the long-term sustainability of the port. The port authority leads, supports and develops programs and initiatives designed to manage and mitigate effects on the environment in and around the port. Our focus is on the stewardship of water, land and habitat within our jurisdiction. We also collaborate with community groups and environmental organizations to support conservation efforts and address environmental risks. We manage local water quality through a number of initiatives, including those that aim to prevent stormwater pollution and in-port ballast water exchange, which can harm local wildlife and contaminate local water sources. Learn more about water quality. With environmental site assessments, we hold our tenants responsible for cleaning up and remediating any contamination that occurs at their sites. As part of our Land Renewal Strategy, the Vancouver Fraser Port Authority also uses a combination of remediation and management approaches to address sites that have been contaminated through past activities. Learn more about land management. A healthy environment relies on all levels of the ecosystem, including small plants, biofilm, fish populations and wildlife. We have implemented a number of measures to help preserve our region’s marine vegetation, safeguard species at risk within our jurisdiction, and prevent the introduction of invasive species. Learn more about aquatic and terrestrial species. The Vancouver Fraser Port Authority leads the Enhancing Cetacean Habitat and Observation (ECHO) Program, which aims to better understand and manage the impact of shipping activities on at-risk whales throughout the southern coast of British Columbia. Learn more about ECHO. To help maintain a balance between a healthy environment and future port development, we have been proactively enhancing local habitat for more than 20 years. Through our habitat enhancement program, we create, restore and enhance habitats throughout the Lower Mainland that benefit our region’s fish and wildlife. Learn more about habitat enhancement. Where and when appropriate, we collaborate with local community and environmental organizations to improve ecosystem health, support conservation efforts, and manage environmental risk. Learn more about our collaborations.